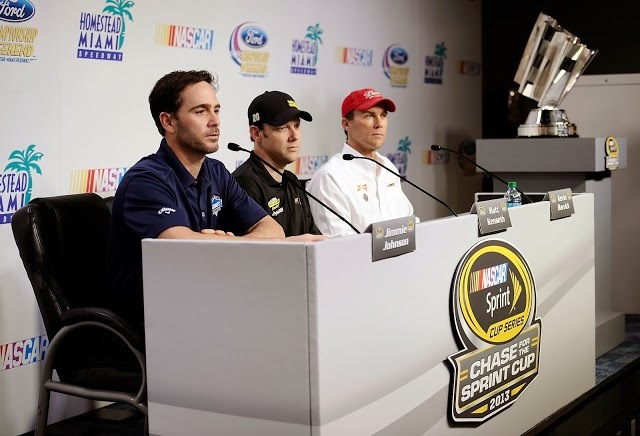 2013 Sprint Cup championship contenders Jimmie Johnson, Matt Kenseth and Kevin Harvick. As NASCAR crowns a champion this weekend at Homestead-Miami Speedway, bringing 2013 to a close, we can't help but look forward to 2014 and the excitement that it will bring. Not that 2013 has been anything but exciting. In a season that saw a veteran driver peak with a new team in just three races, another driver break his back, an engine reach the grandstands and quite possibly the best Tony Stewart interview ever after the wreck at Fontana, 2013 will be remembered by many. But now, with just one race to go before our short off-season, we have to look ahead. Drivers will switch teams, crew members will swap positions and NASCAR will ultimately shift the rules again. It's never too early to hypothesize about what may happen come green flag time at Daytona. 1. Who will be happier to see 2013 end, Kyle Busch or Martin Truex Jr.? Neither. The real answer is Denny Hamlin. Since suffering a compression fracture in his lower back in Fontana earlier this season, Hamlin has been counting the milliseconds until the end of the season. The fracture forced him to get out of the car for six weeks, which made him re-evaluate his love for the sport. Week in and week out analysts wondered whether the team could come back and make the Chase. Hamlin came back determined, but luck refused to be on his side. If it could go wrong, it did go wrong for the No. 11 team, and Hamlin admittedly drove the car in pain every week. As he ponders offseason back surgery, he undoubtedly welcomes a fresh start in 2014. 2. Is it too early to go from a Six Pack to Seventh Heaven? In my opinion, no. The No. 48 never looks like it has peaked, and they always look to be able to turn up the volume at any given time. The personnel on the team remain consistent and with Chad Knaus at the helm and Jimmie Johnson at the wheel, they look to be the leader in the garage. This should make the rest of the field very nervous, but should also make them want to take chances with their equipment. It's well known that Knaus competes in the gray area in the rulebook, so why can't everyone else? Competing in the gray area isn't cheating; it's just using rules that aren't defined. 3. Are we facing the end of an era? With so many seats being vacated after this weekend's race, it's a little hard not to ask this question. We've all gotten used to seeing Kevin Harvick in the No. 29, or seeing Mark Martin's friendly face or Juan Pablo Montoya hanging out with his kids. Out of those three names, only one will return to the track in 2014, and it won't be in his familiar ride. Is our current generation of drivers slowly starting to move on? 4. Will the No. 20 team come back stronger in 2014? The short answer is yes, and here's why. After winning seven times (at press time), the team has already shown their potential. Now, they can use the off-season and fine-tune the details. There were lots of pit-road miscues, which Matt Kenseth is not used to. There were handling issues with the car at different tracks, which will be addressed by Jason Ratcliff and the car chief. The entire No. 20 team will work together over the off-season to pull together and will come together in 2014 as a stronger unit. This will be in part due to a strong presence by Matt Kenseth, who, in the past, held a management-type presence over the No. 17 team at Roush Fenway Racing. I look for him to start doing the same thing at Joe Gibbs Racing very soon. 5. When will Roush Fenway Racing come back to life? Gone are the days of dominant Roush Fenway Fords. Now they are competitive, but not fiercely competitive like the Roush Fenway of the late '90s to early 2000s. What happened? Loss of sponsorship, for one thing. Losing DeWalt as a full-time sponsor hurt the organization more than anyone let on and performance started to decline. They have been able to produce a handful of winning cars, but performance has remained about the same for the past few seasons. What they need to do is go on a sponsorship crusade searching for big-time sponsors who will fully fund the organization. They also need to fully fund a third Cup team, in order to get the communication flowing again. Their Nationwide program could use a revamp as well. Ricky Stenhouse Jr. recently won the Nationwide title in a Roush Fenway car, but even he was partially sponsored, having a different name on the hood almost every week. Consistent money provides consistent opportunity for development. When all of these things come into place, hopefully we will see the Roush Fenway of old.